Turbo Camaro's Chevy 250 inline 6 was manufactured in 1968 (nope, not a numbers matching car) and lets face it, technology has changed, and in a lot of ways, improved over the years. That doesn't mean a brand new Camaro engine is going to be subbed in, but perhaps we can identify some of the outdated components and bring in an upgrade. The distributor has seen some "advances" over the years. The stock distributor ran a points system and in it's day, worked very well. In 1974 GM introduced the High Energy Ignition (HEI) distributor. 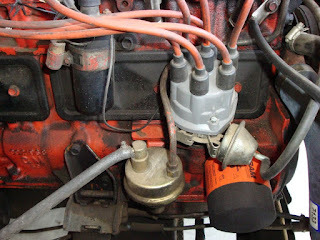 The HEI distributor does exactly the same thing as the stock distributor but the separate coil is in the distributor cap and a control module with magnetic pickup replace the points. The HEI is a more reliable and more powerful distributor that requires less maintenance. Sure, the points distributor was smaller and technically factory "right" for this motor, but it's too much of a loss over the HEI gains. 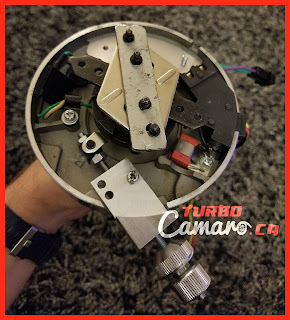 An eBay HEI distributor with a 65000 volt coil was purchased for about $65US. Even though it's an eBay special it's a good piece and has been starting the car without issue since early 2014. The tower for the spark plug wire attached to cylinder #1 was referenced to a point on the engine for easy re-install. The stock distributor and coil were removed and the new HEI unit installed in its place. The fuel line needed to be massaged around the cap because it's bigger than the stock one. The spark plug wires were replaced as they wouldn't fit on the new cap. The original resisted coil wire was replaced with a 12 gauge 12V lead. Even though the new distributor was dropped into the same position as the stock one, the timing was checked and advanced slightly. If you need more detailed instructions on the swap, take a look at this thread. Overall, the upgrade was fairly straight forward and with all the items needed to complete the job, it took about an hour. In January 2018, this eBay sourced GM HEI distributor was locked out, gutted and rewired for electronic timing control with our Holley Sniper EFI System. Despite popular belief, you don't need to purchase an expensive brand name distributor for electronic timing control if you're willing to take the time to make your HEI work. This was a great distributor for this project as it has a 65K coil, 4 pin module and easy to set multi point magnetic reluctor. 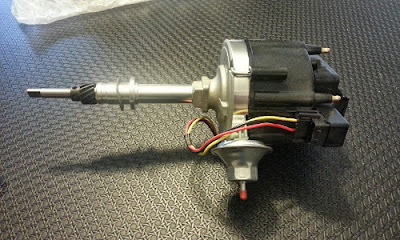 It was working great as an HEI distributor and now it allows the car to run significantly better. The upgrade to electronic timing control requires an Electronic Control Unit (ECU), like a Holley Sniper EFI System. Since the distributor is being modified and gutted in order to provide a new ability to the Sniper System, all relevant information to this procedure has been documented on the Holley Sniper EFI System page. As of now, the module, weights, springs and vacuum canister sit lifeless in a ziplock in the parts bin, probably to never be used again. Technically the modifications and wiring could easily be reversed roadside if needed, so perhaps that ziplock should be in the trunk emergency kit.